Breath-taking vistas and a prime location ... at a terrific price! The Sea of Vapours ("Mare Vaporum" in Latin) has everything the smart lunar property shopper seeks! Add the beauty of nearby Crater Manilius, a distinctive center-of-the-Moon location, and you've got the total package! A superb selection for the discerning buyer, property in the Sea Of Vapors is also an excellent and affordable value. Now, becoming a lunar landowner is simple and inexpensive — plus, you can take advantage of discount pricing that makes ownership of Moon real estate even more affordable! For a close-up view of this region, please see The Full Moon Atlas, Sector D-4. PROPOSED ZONING: Tourism (T-1), Scientific Industrial (S-1), Operations Base (O-1), Light Industrial (L-1) and Commercial Industrial (C-1). The CSS tooltip appears when user moves the mouse over an element, or when user tap the element with a mobile device. Please enter the full, legal name of the property owner as you want it to appear on the documentation. Please select total acres to be purchased for this owner only. Limit: ten (10) acres per purchase. Pricing quoted in $US based on current market rates. Want pricing in your local currency? Click here. If this property is intended to be given as a gift, we will include a free gift note with the shipment (about 10-12 words). Please check for spelling errors before submitting. Shipping directly to the recipient? Don't forget to mention who it's from! Prefer a blank card? Simply enter BLANK in the field below. Giving property for a special occasion, such as a birthday, anniversary or holiday? At no additional charge, we will custom date the documents to commemorate the occasion at your request. Actual claim to the property commences on the order date. If no date is entered, today's date will appear on the documents. GET A DETAILED VIEW OF YOUR PROPERTY! Add The Full Moon Atlas on CD-ROM to your order for only US$8.95 (regularly $29.95). Requires CD drive for access on your computer. * — Viewing PDF copies requires additional software, such as Adobe Acrobat or Foxit Reader (available at no charge). ALL INFORMATION IS CONFIDENTIAL AND WILL NOT BE SHARED WITH ANY OUTSIDE PARTY. Copyright © 1999-2019 Luna Society International. All rights reserved. Pricing and availability current as of 25 April 2019. 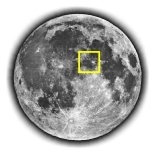 "#OfficialMoon", "MoonProperty.Net", "The Lunar Registry", "Luna Society", "Earth's Leading Lunar Real Estate Agency", "The Crater Company", "Get Mooned! ", "Welcome To The Moon! ", "Nothing Could Be Greater Than To Own Your Own Crater" and "Lunar Republic" are protected trademarks of Luna Society International. All rights reserved under international law.